Angel of God, my Guardian dear, to whom His love commits me here, ever this day be at my side, to light and guard, to rule and guide. Our angels are with us all the time, so why not put them to work? It’s good to thank them throughout the day, to ask for their help in everything we do, and to ask for their inspiration when we don’t know what to do…or what to write…in a blog post, for example. Stories of saints and their guardian angels abound. One we’ll share with you is that of St. Josemaría Escrivá, who had a very special devotion to his guardian angel. Once during a time of intense anticlerical persecution in Madrid, a would-be aggressor stood menacingly in Josemaría’s path with the obvious intention of doing him harm. Someone suddenly stood between them and drove off the assailant. It all happened in an instant. The protector came up after the incident and whispered to him: ‘Mangy donkey, mangy donkey’, the expression Josemaría used to refer to himself in the intimacy of his soul. Only his confessor knew about this. Peace and joy filled his heart as he recognized the intervention of his Angel. It’s great to know we have such a friend and protector helping us on our journey to Heaven. Let’s thank God for our angels today! 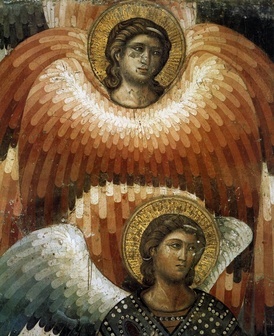 This entry was posted in Devotions, Saints & Angels and tagged angel, angels, friend, guardian angels, heaven, help, protector, saints, St. Josemaria Escriva by texasnuns. Bookmark the permalink. Thank You for this beautiful posting today. Since my early childhood years, I have had a devotion to my Guardian Angel. He has assisted me many a time. To share a personal story, about 20 years ago, having lived in San Antonio only a few months I was coming home from work late one evening and I was approached by a young man who looked intimidating to say the least. Well, he asked me for the time, and naturally I told him and continued on my way to my apt. (I used the bus, local transportation). Not realising that he was slowly walking behind me, he suddenly jumped on me from behind and I feel into the shrubs on the side. He began choking me and by Divine Providence I managed to pray out loud even tho I was being choked. The man suddendly stopped his attack/choking and told me, “you are lucky, because I was going to kill you! ‘I don’t know why I stopped?” He got up took my $15.00 and recently purchased Seiko watch and left. I know it was my Guardian Angel and All of Heaven. I immediately reagained my composure as best as I could and Thanked Jesus, Our Lady and My Guardian Angel for saving my life. Yes, I was scared, but more importantly Thankful! Today is another great day! A day like today in 1928 the Holy Spirit inspired Saint Josemaria Escriva and he “saw” the Opus Dei. A path to holiness to all kinds of people in their own state of life. We are called to sanctify our work, sanctify others through our work and sanctify ourselves. So that people see Christ through all of us! What a beautiful way to go to Heaven. May your Guardian Angels guide you and protect you! May God place a few in care of this beautiful blog!